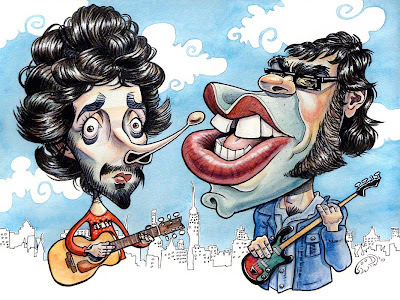 Here are Bret and Jemaine from the great show "Flight of the Conchords" on HBO. If you haven't had the pleasure of seeing it, there's a plethora of deliciously dry, British-type sitcom/mockumentary humor mixed with unpredictable, funny song parodies of music from a range of different genres. A very different, fun and catchy show if you've got an offbeat sense of humor and a love for the brilliantly stupid. You can find pretty much all their songs on youtube, for starters. I decided to use nero lead with watercolor for the first time on watercolor paper. I think I prefer the contrast of those dark and thick lines to the rest of the page compared to the more subtle contrast of 4B graphite. It really makes the figures POP! all that much more. I'm a big fan of contrast. Some pieces don't need as much contrast, but with everything going on in the piece, I found it necessary. For a while I wasn't sure how I would go about drawing the city scape, which is featured on their official poster and on DVD menu screens and made for a great solution of what to occupy the background with. The lines are fairly consistent in width and are also about as thin as you can draw with nero. That being said, as nero is a type of lead, it needs to be sharpened by rubbing it onto a piece of paper until it comes to a chiseled point, and for extremely thin lines, this needs to be done every few seconds. An obvious solution came to me after finishing with the linework of the figures. I had several black gel-ink pens which smudge easily but were the perfect width for the linework and had a great fluidity that allowed me to nearly perfectly duplicate the look of that cityscape. I first tried one out on a scrap piece of watercolor paper, and without really even trying was able to duplicate the look of the poorly drawn but perfect-for-the-show skyline drawing. I figured out basic placements and compositions of buildings with light pencil and then went in with the pen, really not spending much time on it, and intending to do that so as to really capture the look of the original. The next dilemma came from how to go about painting the sky around the figures in a single watercolor wash. Luckily for me, when I checked out a dvd menu screen for reference of the cityscape, there were swirly clouds in the sky, which not only added the whimsical and fun quality of the show but also broke up the blue of the sky so that I could paint that blue in 5 washes instead of 1. Much easier. Overall, I'm pretty happy with this (the negative space of this piece is something I really worked and focused on this time), and it's probably one of the best caricature illustrations I've done if not the very best. Ahhh, progress!! this looks real nice. great illustration. Thats a goodwin! Its funny that my word verification word is "lamers" believe it or not. I think the computer is making fun of my pun. Haha I love bad puns, and yours was eggscelently awful. I heard a lot of "good one, goodwin!" in college. Oh, and thanks!